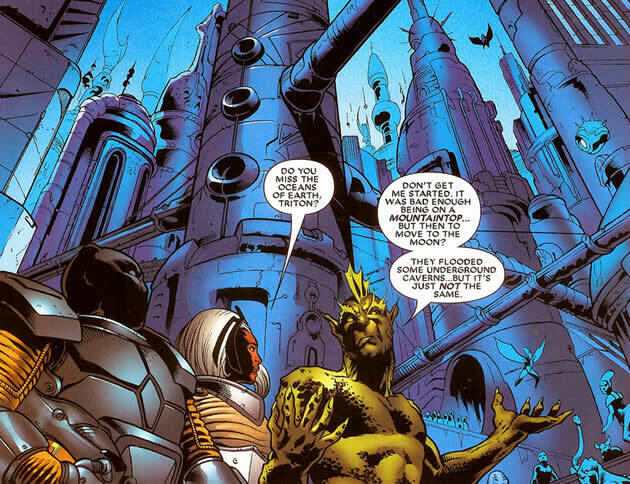 Triton is a member of the Inhuman Royal family. He has the ability to survive underwater. Triton is the brother of the Inhuman Karnak and is a cousin of Blackbolt,Maximus, and Medusa. As an infant he is exposed to Terrigen Mist and evolves. He does not turn into an alpha primitive like many Inhumans fear, but he does become monstrous in appearance. Further Triton is unable to survive in the open air and must live in water. This highly isolate him from the rest of his society especially initially. The terror of seeing their son being isolated in this way is enough for them to forego exposing their younger son, Karnac to the Mists at all. Within Attilan there was a special section devoted to a water aquatic area where Triton lived. Maximus creates a method / device that allows Triton to survive outside of water. It is like a breathing mask. This greatly enhances his life as he is able to walk about and interact with those on the ground. Triton takes part in the search for Medusa. He is also there for the first encounters between the X-Men and Fantastic 4. He is generally shown to be one of the more friendly Inhumans despite his appearance. This may be due to the fact he often feel isolated and estranged from his own people. He has strong friendship with the Thing in part to both developing monstrous like appearances. He has also been shown as being friends with the X-Men Colossus and Nightcrawler. 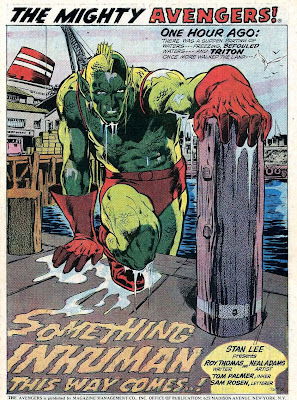 He has also been shown as a friend of Namor the Sub Mariner. Triton often acts as a scout of the Inhumans. He also gets stir crazy in Attilan due to the limitation it presents on his ability to swim. For this reason he is often traveling back to Earth to be in the Ocean. For both of this reasons he has more contact with the outside world. During Secret Invasion the Inhumans and Kree ally themselves against the Skrulls. Triton is given a special mission on an aquatic planet where he must through merpeople to achieve his objective. Despite vast forces against him, Triton completes his mission. Scales, Fins, webbed feet allow Triton to swim and maneuver at high speeds underwater. 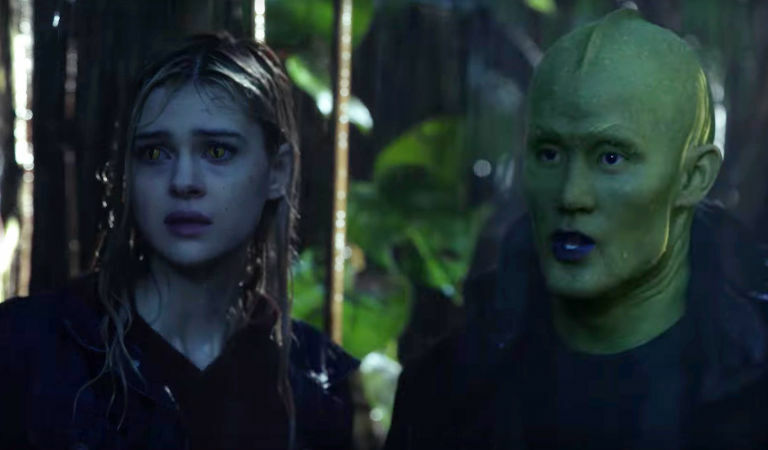 Triton appears in the TV series Inhumans where he is played by actor Mike Moh. Triton is sent to Earth by Black Bolt to help the NuMans new Inhumans who began to appear on the planet. However while aiding an Inhuman he ran into soldiers and was forced to flee into the ocean. 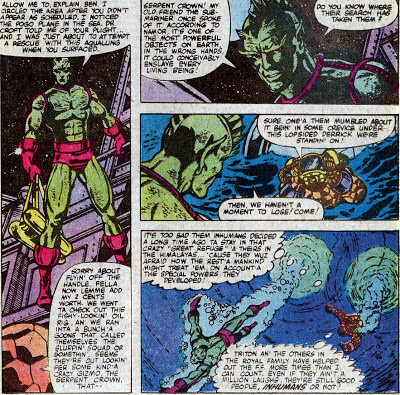 Blackbolt sends Gorgon down to find and retrieve Triton. While the 2 are on Earth, Maximus commits a coup d'etat and the rest of the royal family are forced to escape to Earth. Eventually they find each other and return to Attilan to confront Maximus.